So I've learnt a stack this year as I've undertaken 10 subjects (5 per semester) at Ridley Melbourne this year. But not only that I've been privileged to attend Plentylife which is a new Anglican church plant on Melbournes northern fringe which is built around the Sheffield Missional Communities model. 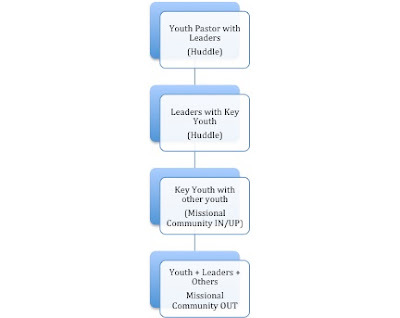 Anyway, I've got to recently thinking about how a missional communities church could structure its youth ministry. And well I haven't got all the answers yet but here's my first draft of a basic skeleton. Basically I think the youth pastor needs to primarily equipping and releasing the leaders to be missional disciple makers. Those leaders then release and equip those youth whom you have identified as being key or core members of the youth ministry. The leaders then release and equip those youth to run the IN/UPs of the youth missional community and then together as a community you go on OUTs together. Which may or may not look something like regular youth ministry. I think this strikes that balance of low control with high accountability that seems such a key part of the Missional Communities model, as well as actually equipping the youth to step up into greater responsibility. Now, I haven't ever tried this. I have no idea if it works. I don't even know if it maps 100% properly with Missional Communities stuff. But it's a first attempt. I'd love your feedback. If you're a Missional Communities person and are familiar with all the stuff from Sheffield and Mike Breen and 3DM then tell me how you've structured things? Obviously one of the issues with using a skeleton like this would be working out the timing of everything. 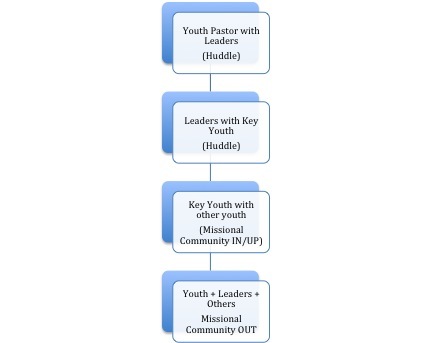 The youth leaders need to be at everything (the huddles, the IN/UPs and the OUTs) plus they are likely going to want to be involved in the church at large too. When you start factoring those time issues in, it starts becoming a really big commitment for a working or studying volunteer. You might almost need a monthly cycle. But aside from the timing issue, I think something like this needs to be the aim for a Missional Communities style Youth Ministry. Empowerment is a strong force. I think you're on the right track!